Labor of Love Adoptable Pets! Bailey's Way Rescue Adoptable Pets! Do I Have to Vaccinate My Pet? Have you ever wondered if the vaccinations your pet receives are really needed? Although getting your pet into the car for the drive to the veterinarian's office isn't always easy, skipping vaccinations can have a serious impact on your pet's health. Reduction of Disease Transmission. When the majority of pets are vaccinated, they can't spread diseases to other animals. Vaccination plays an important role in preventing rabies and other infectious diseases from flourishing. Vaccinating your pet also protects other animals that are too young to receive the vaccines yet. Lower Costs. Treating the diseases that vaccines prevent can be very expensive, particularly if the disease causes chronic health problems. Vaccinating your pet is a simple, effective way to avoid high-cost treatments that can derail your budget. Reduced Zoonotic Disease Rates. Zoonotic diseases, such as rabies and leptospirosis, are passed between humans and animals. Vaccinating animals against the diseases also protect humans. Compliance with Local Laws. Most municipalities in the U.S. require rabies vaccination for pets. Vaccination may be needed to obtain a license for your dog or cat. Antigens, substances that trigger the production of antibodies, are contained in vaccines. Antibodies identify foreign bacteria and viruses and react quickly, killing the invading organisms before they can cause disease symptoms. Inspired by the backlash against vaccines for children, some pet owners have decided to opt out of vaccinating their dogs and cats. Many people who don't vaccinate their dogs or cats express concerns about possible side effects. New York Magazine reported on the issue in its February 2015 edition, noting that widespread vaccine avoidance can trigger outbreaks of diseases that were once thought to be under control, such as distemper. Distemper affects the nervous, respiratory and gastrointestinal symptoms of dogs. Dogs affected by the disease may have high fevers, watery eyes, hardened foot pads, coughing, vomiting, seizures and paralysis. The death rate for distemper is high. If a dog doesn't die from the disease, he or she may have lasting nervous system damage. The distemper vaccine offers a simple way to prevent death and suffering. All vaccines may cause side effects, but side effects are usually mild, don't last long and don't affect every dog. Common vaccine side effects include fever, appetite loss, lethargy, vomiting, diarrhea or hives. Before your pet receives a vaccination, his or her veterinarian will perform a thorough examination and may even recommend a few tests to ensure that your pet is healthy enough to receive the vaccine. The veterinarian may also recommend checking his or her immunity level before offering a vaccine. Your pet will probably need a combination of core and non-core vaccines. Core vaccines are vaccines that every pet should have, while non-core vaccines may be recommended based on the area of the country in which you live and your dog or cat's potential exposure to various diseases. 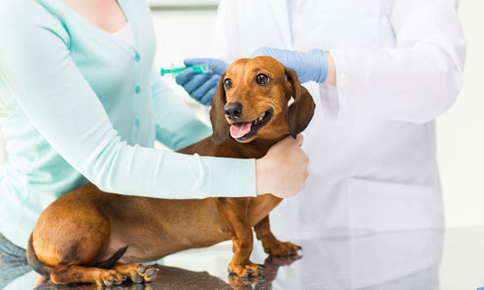 Core vaccines for dogs include rabies, canine distemper, parvovirus and canine hepatitis, while non-core vaccines may include Lyme disease, parainfluenza, bordetella or leptospirosis. Rabies and feline distemper are core vaccines for cats, in addition to calicivirus and feline herpesvirus. Non-core vaccines for cats include feline leukemia and bordetella. All pets don't receive the same vaccines. Factors that affect which vaccines are offered include your pet's age, health, habits, lifestyle, vaccination history and potential risk of contracting certain diseases. Puppies and kittens receive a series of vaccinations to bolster their immune systems, while older animals may only need vaccinations every one to three years, depending on the vaccine type, their immunity and local regulations and recommendations. Even if your pet requires several vaccinations, he or she won't usually need to endure multiple shots. Many vaccines can be combined to make the injection process as easy as possible. Some vaccines are also available in liquid form. Keep your pets and your family safe by vaccinating your dogs and cats. Call us today to schedule an appointment. Sign up using the form or call 813-643-7387.